Home Tags Posts tagged with "Suffolk County Community College"
Huntington and Northport girls track members put their best feet forward at the Suffolk County track & field large school championships Feb. 2. held at Suffolk County Community College in Brentwood. Huntington sophomores Ella Siepel and Valerie Rogel finished 5th and 10th, respectively, in the finals at 3,000 meters clocking in at 11 minutes, 35.33 seconds and 11:51.66 respectively. Huntington junior Alicia Brooks tripped the clock at 7.55 seconds in the 55-meter dash for 6th place in the county. Huntington seniors Keily Rivas and Erica Varady finished the 1,500-meter race walk in 7th and 9th place crossing the line at 7:32.75 and 7:38.85, respectively. Rogel’s time of 5:30.69 in the 1500-meter race was good enough for 6th in Suffolk. Northport senior Margaret Van Laer cleared 4 feet 8 inches in the high jump finals placing her in a four-way tie for 3rd place. Northport senior Sydnie Rohme traveled 17-4 1/2 in the long jump placing her in the top spot of the 2nd flight and her teammate Ashley Curcio leapt 15-5 1/2 to finish in 5th place in flight 1. Curcio finished 3rd in the triple jump with her best distance being 30-10 1/2. Huntington’s Grace Mckenna earned top honors in flight No. 1 in the shot put by throwing 30-4. Both the girls and boys track & field are back at the college Feb. 11 for the state qualifiers where the first gun sounds at 5 p.m.
As Puerto Rico continues to recover a year after Hurricane Maria left devastation in its wake, some college students reflected on lasting memories of their missions to the island to offer help and support. This past summer more than 650 State University of New York and City University of New York students along with skilled labor volunteers helped to repair homes on the island through Gov. Andrew Cuomo’s (D) New York Stands with Puerto Rico Recovery and Rebuilding Initiative, according to the governor’s website. During a 10-week span, five deployments of volunteers worked on the island with the goal of repairing the roofs of 150 homes. By the end of the summer, the volunteers fixed the roofs of 178. Peter Velz, SUNY assistant vice chancellor for external affairs, said since October 2017 the university system was working on engagement with Puerto Rico. On March 16 students from SUNY Alfred State and Geneseo went down for a week. He said he believes the interaction with the homeowners was probably the most impactful for the students, and the residents they met in Puerto Rico tried to pay them back the best they could. Rebecca Mueller, one of 21 Stony Brook University students who volunteered, traveled to the island in July, as did Joseph VanderWaag, who attends Suffolk County Community College’s Ammerman Campus. Mueller, 23, of Coram, a graduate student working toward her master’s in social work, said when she received an email from SBU looking for students to travel to Puerto Rico she knew she had to help. VanderWaag, 20, of Smithtown, who is in his last semester at SCCC, echoed those sentiments. “It was so devastating to see that these were our citizens not really getting any help,” he said. Traveling to Catano and surrounding towns where her group was working, Mueller said she saw houses with no roofs, windows or doors. She worked on three homes during her stay, and said the students would climb to the top of roofs and roofers with the nonprofit NECHAMA — Jewish Response to Disaster showed them what to do. Two of the buildings she worked on had second stories before Hurricane Maria, but the upper levels were destroyed by the storm, and the volunteers had to turn what was left into roofs by scraping up tiles, finding cracks, grinding them to open them up and then sealing with cement. The volunteers then primed and sealed the new roofs to make them waterproof. Mueller said she also helped to clean out one man’s bedroom that was unlivable after water damage from the storm. The room had mold and bugs, and his bed, clothes and other items needed to be thrown out. VanderWaag said the homeowners he met didn’t have a lot of money so whenever there was a leak they would go to the hardware store for a quick fix to patch the roof. When the students weren’t working, he said they would talk to community members about the hurricane’s devastation and the response from the U.S.
“They are a mixture of upset, angry and feeling just almost betrayed,” he said. VanderWaag said he’ll always remember how appreciative the homeowners were and how one woman cried after they were done. Her husband who was in his 70s would try his best to fix the leaks by carrying bags of concrete up a ladder and patching the leaks. “It was a huge burden lifted off their shoulders,” VanderWaag said. Mueller said one family cooked lunch for her group and others working on the house next door every day. She said the students had time to sightsee, and when one tour guide heard what they were doing, he offered to take them on a free tour of the south side of the island. Both she and VanderWaag also visited Old San Juan and saw historic military forts during their trips. Pascale Jones, SBU international programs coordinator, joined students for a week to help out. She said when she saw the students in action, she was amazed at how much they already knew about construction and found the whole experience to be humbling. Originally from Port-au-Prince, Haiti, Jones said she is used to seeing a certain level of devastation but was surprised to see the state of some of the homes. Students who have served and their families are receiving some transitional support. U.S. Reps. Lee Zeldin (R-Shirley) and Peter King (R-Seaford) announced the expansion of the VetsSuccess on Campus program to Suffolk and Nassau County community colleges. The initiative, through the Department of Veterans Affairs, helps veterans, service members and their qualified dependents succeed in school using a coordinated delivery of on-campus benefits assistance, including referral services and peer-to-peer counseling. The program is intended to lead students to graduation and prepare them to enter the workforce in viable careers. Suffolk County is home to the largest number of veterans in the state. SCCC serves more than 700 military-connected students annually across three campuses, and NCCC serves more than 300. Students like retired Air Force Master Sgt. Olivia McMahon benefit from the program, and she said she’s thrilled to hear that what she was once provided remote access to will now feature a more personal connection to resources and benefits. Christopher Holder, the VetsSuccess on-campus program counselor, was at the April 4 press conference to talk to veterans about his position in the program and share firsthand experience with re-acclimating to society. During the event, Zeldin and King presented SCCC Vice President of Student Affairs, Dr. Christopher Adams, with an American flag flown over the U.S. Capitol in Washington, D.C., to commemorate the expansion of the program and to honor the veterans it serves. VetsSuccess on Campus began as a pilot program in 2009 at the University of South Florida in Tampa and has expanded to such an extent that SCCC and Nassau are now two of 99 colleges in the nation with the program. By mid-August most of our college-age students are winding down summer jobs and getting ready for the new semester. We have local college students studying at some of the finest colleges and universities in the country and around the world. There is another group of college students getting ready for the new semester. They are the freshman class of 2017. A large group of college freshmen will commute to Stony Brook University and the other four- year schools here on Long Island. A growing number of college students will attend the best-kept secret in higher education — Suffolk County Community College. I have had the privilege of teaching at SCCC for more than 30 years in the social science department as a professor of sociology. I have met some of the finest college educators in the country there. I’ve also been privileged to work with some of the finest students in higher education. So many of them while at Suffolk lay the foundation for an extraordinary future. They are our future civic leaders, our doctors, our nurses, our business leaders, our lawyers, our scientists, our teachers and our social workers to name a few professions. Many of our Suffolk graduates go on to some of the finest colleges and universities in the country and around the world and make profound contributions to science, technology and research. As we are being challenged to reorder our priorities, education must remain at the top of that list, and SCCC needs to be supported as one of the greatest educational treasures in our community. With every new freshman class, parents struggle with anxiety and intensified worry about their children; they are reluctant to cut the umbilical cord. The landscape for college freshmen is much more complicated and challenging than ever before. Whether you go away or stay home, college is not high school. Responsibility and accountability are critical for success! Your professors will assist you academically and personally, if you are committed to the learning experience. They will not coddle you or tolerate reckless irresponsibility. Many professors will have an attendance policy and only if you are in a coma, will you be excused for missing class. Cutting usually impacts your final grade. Choice is another challenge. You choose to go to class or to skip. Every class you cut roughly costs you a little more than $100 from your tuition. It’s a choice to stay out all night if you’re away at school and not get up and get to class on time. Drugs and alcohol are present on every college campus, no matter what the school’s public relations department says. It’s a choice to overindulge and to act recklessly. Most colleges and universities have wellness centers that provide a wide range of confidential mental health services for students. They have trained professionals that work with students to develop the appropriate skills to navigate the stresses of college life and when necessary make appropriate referrals for additional care and support. Many public and private colleges across the country have campus ministry offices that provide a wide range of spiritual support services for students of every religious tradition and usually a wide range of community service opportunities. Parents, when you have your pep talk with your college freshmen, encourage them to use all the support resources available when they are attending school. Dispel the stigma from reaching out for support when they might feel overwhelmed or even frightened. It’s natural and normal. It’s how they embrace their feelings that will make all the difference. The college experience is an exciting adventure that encourages all students to open their minds — become critical thinkers and to move beyond the limits of their comfort zone. College can and should be a transformative and life-changing adventure. On May 21, Stony Brook Village reverberated to the sounds of a New Orleans-style street parade to mark the opening of The Jazz Loft at 275 Christian Ave. That happy day brought to reality the dreams of president and founder Tom Manuel. “In the brief seven months the Jazz Loft has been open we’ve been able to accomplish the goals of our mission well ahead of schedule,” Manuel said. “Our performance calendar has presented some of the finest local, national and international artists; our educational programming has established our pre-college Jazz Institute in collaboration with Stony Brook University; and Our Young at Heart program has introduced wonderful music therapy events to people with memory loss. For establishing The Jazz Loft so quickly and effectively as a community resource, Manuel, a 37-year-old educator, historian and trumpet player, from St. James, is recognized by TBR News Media as a Person of the Year. Visitors are able to view the loft’s museum exhibits featuring greats such as saxophonist Louis Jordan, the biggest African-American star of the 1940s and a massive influence on the ensuing rock ’n’ roll era; heartthrob blues and jazz crooner Arthur Prysock; upright bassist Lloyd Trotman, a prolific session musician who provided the bass line on Ben E. King’s anthem, “Stand by Me”; society bandleader Lester Lanin; and the seafaring vibraphonist and composer Teddy Charles. Jean Prysock, of Searingtown, donated the memorabilia of her late husband Arthur Prysock, who played the top theaters and clubs from the 1940s onward and recorded for labels such as Decca, Mercury, Old Town and MGM-Verve. Why did she feel Manuel was worthy of support? Manuel has directed a full program at The Jazz Loft while holding an adjunct post at Suffolk County Community College and a faculty position with Stony Brook University directing the jazz program of the Pre-College Music Division. If that’s not all, he has recently completed his doctorate, a DMA in jazz performance, at SBU and carried out charity work in Haiti. “Tom is fully deserving of this award, not only for creating The Jazz Loft and making jazz available in our area, but also because of his remarkable spirit in bettering every community with which he engages,” Perry Goldstein, professor and chair at SBU’s Department of Music, said. “He motivated seven volunteers to go to Haiti with him after the recent hurricane, where they distributed 200 pairs of sneakers, clothing and school supplies purchased through donations. Tom radiates positive energy in everything he does,” Goldstein said. The jazz facility is housed in a historic building, comprising the old Stone Jug tavern and the former firehouse station, which accommodated the first museum in Stony Brook, founded in 1935 by real estate broker and insurance agent O.C. Lempfert. With the backing of Ward and Dorothy Melville, the museum was formally incorporated as the Suffolk Museum in 1939 before evolving into today’s The Long Island Museum. The renovated building, which was accorded landmark status by the Town of Brookhaven in September, is leased long term to The Jazz Loft by The Ward Melville Heritage Organization. Brookhaven Town Highway Superintendent Dan Losquadro (R) and Brookhaven Town Councilman Kevin LaValle (R-Selden) joined with members of the Veterans of Foreign Wars Sgt. Santora/Staff Sgt. Bonacasa Memorial Post 400 to announce the completion of new sidewalks from the VFW to the traffic signal at the entrance to the Ammerman Campus on Suffolk County Community College’s Selden campus on College Road. In addition, the Brookhaven Highway Department installed a pedestrian crossing at the signal. “The enhancements made along College Road, across from both the VFW and SCCC, will allow for increased pedestrian safety in the area,” Losquadro said. The highway superintendent said the VFW Memorial Post 400 offered the use of its parking lot as an overflow lot for students from Suffolk County Community College, many of them returning vets. VFW Memorial Post 400 Commander John Rago also extended thanks to all of the Town of Brookhaven members involved in the project. Suffolk County Community College in Riverhead held an opening reception last week for its annual Eastern Campus Student Art Exhibit, a show that takes place every fall in the Lyceum Gallery of the Montaukett Learning Resource Center on the Eastern Campus. The salon-style show serves to highlight exceptional work created by students in the college’s applied arts programs. This year’s exhibit contains over 60 works that will be displayed in a variety of media and sizes, all of which have been done for classes on campus within the last two years. Students majoring in photography, graphic design, computer art and interior design were able to submit up to three pieces of their choosing and have the opportunity to leave their often-isolated creative spaces and gauge a reaction of their work from the public..
Ralph Masullo, professor of photographic imagery, said that the gallery has proven to be incredibly valuable for the artists in many ways. Sarah Mullen, 22, of Centereach, said that this was her first art exhibit on a college-level, even though she’ll be graduating from SCCC this year with a photography major. 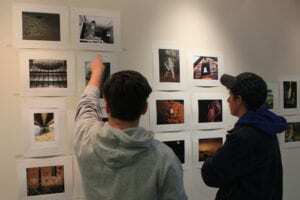 Mullen submitted two photos that will eventually be part of a travel photography book she’s been working on this semester as a special project that highlights lesser-known locations on Long Island. One was taken at Avalon Park in Stony Brook and the other at Prosser Pines in Middle Island. The photo titled “Nature’s Tranquility” of stone steps ascending deeper and deeper into a beautiful forest is so mesmerizing that it became the official image for the reception, appearing on all promotional fliers. One of the most striking photos in the gallery came from Kiera Pipe, 19, of Miller Place. Taken at Peconic River Herb Farm in Riverhead, the photo captures a sundress hung up on a line in between two shutters on the top floor of a rustic and worn-down barn. One observer said it was haunting and looked almost ghost-like. Pipe, who’s a photographic imagery major, said that she likes to see whether or not her work means something to someone else or provokes an emotion of any kind. Constructive criticism, she said, makes her a better artist. Growing up on the North Shore, she naturally gravitated toward photography, with a specific focus on landscapes. The exhibit is open through Dec. 14 in the Lyceum Gallery, located at 121 Speonk Riverhead Road on the Eastern Campus in Riverhead. Gallery hours are Monday through Thursday 10 a.m. to 7 p.m., Friday from 10 a.m. to 4 p.m. and Saturday from 11 a.m. to 4 p.m. The gallery is closed on Sundays and holidays (gallery closed from Nov. 24 to 27). A friend of mine, who is about my age and grew up on Long Island, was somewhat timid about going into the Big Apple on her own because she didn’t feel she knew how to get around, but she now is empowered by her car service. She is a member of the customer base of Uber or Lyft or Via — one of those and others that she can summon with her cellphone to take her on her errands around the city. The service comes within two or three minutes, and she gets in and gets out, sometimes sharing the ride with another passenger, without having to so much as reach for her wallet. The fee and tip are automatically charged to her credit card and the price is significantly cheaper than an ordinary taxi. It is as if she had a chauffeured limo at her beck and call. As a result she uses the service more often. When a store charges prices that are generally considered too high by shoppers, the store invites competition to come into the neighborhood. The same rule of economics applies to manufacturers and to industries. Sometimes that competition takes the more profound form of disruption by competitors who are aided by advances in technology, like the cellphone. In the instance of my friend and many like her, the car services have severely disrupted the taxi industry, dropping the NYC medallion price considerably. Another vulnerable industry is higher education. As the cost of a college education has gone up over the last 50 years by about twice the rate of inflation, the ability to secure a bachelor’s degree has moved beyond the reach of the average household. The result has been an untenable explosion of student — and parent — educational debt. This trend has also exacerbated the widening gulf between the haves and have-nots. Those without a four-year degree earn less over the course of their lives. While there are good public universities and community colleges, like Stony Brook University and Suffolk County Community College, that are more reasonably priced and often allow the student to live at home and avoid room and board fees, there is another, growing option for students. Some colleges, including those with more well-known names, are offering bachelor’s degrees online. Although this may have struck many as snake oil in the past, today an online degree has become a viable option thanks to enormous technological gains — with more to come. Professors can stand in front of a class of students numbering from a handful to several hundred on campus. But thanks to webinars and other advances on the web, their student listeners may number in the thousands. Ah, you say, but they miss the live interaction of a classroom setting. Wrong. The students can now hear each other, as well as the professor, speak to each other and even see each other. There is more interaction over the Internet, in fact, than there is typically in large lecture classes. Shortly the speed of the Internet will reach unimaginable numbers to accommodate the instant transmission of incredible amounts of information. Professors attest to the high quality of response from the online students handing in assignments. There is even technology for locking down computers during tests to prevent cheating. Online education has already disrupted traditional education, and not just for special one-off events that are typically used by businesses and special-interest groups but for long-term degrees. Just Google “online degree programs USA,” and you will find 10 pages of names for starters. These include 2016 Top Online Colleges & Degrees, The 50 Best Online Colleges for 2016, List of Accredited Online Colleges & Universities, U.S. News & World Report 2016 Best Online Programs, Boston University online programs and so forth. Habits change more quickly today than at any other time in history. Just ask me how people get the top of the news each day: It’s not so much from newspapers or radio, or from network television or even cable TV — we get up in the morning and eyeball our mobile phones. Pay attention, college administrators and trustees, serious disruption is near. A $2.9 million cybersecurity, manufacturing and health information technologies U.S. Department of Labor job training grant — the largest single grant in Suffolk County Community College history — has been awarded to the college. The college will collaborate with Suffolk County Workforce Development Board, New York State Department of Labor, Suffolk County Department of Labor and independent business, including Alken Industries Inc., GKN Aerospace Monitor Inc., Precipart Inc. and Custom Computer Specialists Inc., as well as business-related nonprofit organizations the Manufacturing Consortium of Long Island, Long Island Science Technology Engineering and Math Hub and New York State Workforce Development Institute in executing the grant. The $2,949,237 Resources and Education that Support Training Opportunities within the Regional Economy (RESTORE) Grant, according to college president Shaun L. McKay, will be used to train individuals by providing them with the skills and credentials required to meet the growth in cybersecurity, manufacturing and health information technology. RESTORE is part of the federal government’s national TechHire initiative that is funded by H1B visa fees, nonimmigrant visa that allows U.S. companies to employ foreign workers in specialty occupations that require theoretical or technical expertise in specialized fields such as in architecture, engineering, mathematics, science and medicine; and intended to train local workforces with the skills required by regional industry. “The RESTORE Grant will allow our college to focus new and additional resources on recognizing and empowering residents in our region with the education and training they need to develop new skills and earn higher wages,” McKay said. The president explained that some workers may be just starting their careers, while others may be older workers who don’t have the basic skills to allow them to assume more responsibility and reach higher paying roles. Others could also be workers who may have the competencies but not formal credentials to excel at a more senior-level job in their field. The RESTORE Grant will provide the resources for retraining individuals and upskilling to earn an associate’s degree and transfer to a baccalaureate program for expanded career options. Boot camp training programs will be developed and students will prepare for online coursework while learning valuable industry and job readiness skills to help them excel. McKay said the college envisions the RESTORE Grant providing training for 350 students. Greatness in the world of athletics was on display to be celebrated Friday night. Members of the 27th class of the Suffolk County Sports Hall of Fame were inducted at a ceremony held at the Hyatt Regency Hotel in Hauppauge. They will join past inductees like Boomer Esiason and Craig Biggio in the pantheon of impactful Suffolk sports figures. Among the inductees were Northport star lacrosse player Jill Byers; Setauket resident and 27-year New York Jets beat reporter, Rich Cimini; legendary Harborfields football coach and Smithtown football star, Tom Combs; the first varsity boys’ basketball coach at Comsewogue, Frank Romeo; and Deer Park three-sport standout and football All-American at Stony Brook University, Chuck Downey. Richie LoNigro, owner of Port Jefferson Sporting Goods, which has been open since 1973, was also honored with a special recognition award. Byers graduated from Northport in 2005. She is the only athlete to be named All-Long Island team in three sports during her high school career, playing basketball, soccer and lacrosse. She was a two-time All-American in lacrosse during high school, and also received the distinction four times during her career at the University of Notre Dame. She also competed on the United States women’s lacrosse national team. Cimini is the longest tenured Jets beat reporter in team history, working for the Daily News, Newsday and for the past six years, ESPN. He has received awards from the Associated Press and the Pro Football Writers of America for his work over the years. He joked that he didn’t feel like he belonged in a class with people who accomplished so much on the field, being that his accomplishments took place entirely in the press box. “I feel like the nerd who got invited to the cool kids party,” Cimini said. He mentioned his supportive parents and his understanding wife of 25 years, who is okay with planning their lives yearly around the NFL schedule. “She’s the real hall of famer in our family,” Cimini said of his wife Michelle, who is actually a lifelong New York Giants season ticket holder. Tom Combs has been the athletic director in the Patchogue-Medford school district since 2003. Before that, he played Division II football at Ashland University in Ohio following his four years at Smithtown. He became the head football coach at Harborfields in 1990, where he won five county championships and two Long Island Championships over a 13-year run. Combs has two daughters who followed in his footsteps and became teachers and coaches.. He thanked his family, friends and players for helping him to achieve the successes that led to his induction. In 1968, Frank Romeo became the first varsity basketball coach at Comsewogue. During a 24-year span, Romeo led Comsewogue to eight league titles, one large school Section XI title and 15 straight playoff appearances. From 1987 to 1990, Romeo’s record was 62-5. He left Comsewogue to become the head basketball coach at Suffolk County Community College in 1992, where he made the playoffs in all of his seven seasons there. Romeo used the word “we” repeatedly about his spot in the Hall of Fame. Chuck Downey was a standout wrestler, football player and lacrosse player during his years at Deer Park. He was a part of Stony Brook University’s first football team in 1984, where he still holds nearly 30 school records and 12 NCAA records. He was a three-time All-American while at Stony Brook, which earned him a professional contract with the National Football League’s Philadelphia Eagles. That marked the first time a Stony Brook athlete signed a professional sports contract. Downey has since followed in the footsteps of his father Raymond, an FDNY Battalion Chief. His father died in the line of duty on Sept. 11, 2001. Weiss gave Downey a memorable introduction. “What a great way to end a wonderful evening with an inductee who epitomizes the word hero from a family of heroes,” Weiss said of the last member to be announced. Downey joked that he’d rather be in a burning building then standing in front of a room full of people to speak. “I’m truly honored and deeply grateful to be up here tonight along with these other amazing athletes,” he said. Many of Richie LoNigro’s 12 children, 25 grandchildren and five great grandchildren were present to honor the man who has become a fixture in Port Jefferson. To learn more about the Suffolk Sports Hall of Fame visit www.suffolksportshof.com.